The driving is beginning to get to me. You don’t realize how big France is until you circle it in a car. Got up at 8 and it the road by 9 to Beaune – the next town north. Walked around town checking out all the wine accessory merchants (like a super Wine Enthusiast catalog) but bought nothing. Had my eye on a temperature / hygrometer set but it was in Centigrade. Went into the Hotel Dieu, which was a hospital established in the middle ages during the plagues, that remained open until 1971. Very nice exhibits of medieval pharmacy, patient care, and surgical stuff. They were the state of the art for their time. There was an incredibly detailed Last Judgment polyptic, which the terminally ill could look at on Sundays. Shows the separation of the good and evil to Heaven and Hell. That’ll make you repent your sins! Jill had a fromage tart with jambon for a late breakfast. I probably haven’t mentioned it, but there have been some great patisserie breakfasts in the last 2 weeks. Yum! Then we went into the Marche des Vins, per Mr. Steves’ recommendation. It’s a wine tasting experience where you pay 50F per person, get a tasting cup souvenir, and taste as much wine as you like. All the wine is under the label of one merchant, however it is produced by many different wineries. You are led into the caves in the basement where about 35 stations are set up, each with a bottle, a candle, and a spittoon, and a dozen or so bottles of the wine. You may proceed at your own pace. Pretty much the only light is from the candles, so it’s fairly dark and romantic. We skipped most of the whites and headed for the reds. They got a little confusing after a while, as there is nothing to cleanse your palate with. We ended up buying (probably tremendously overpriced) a $20 and a $55 Burgundy. All the wine here in Beaune seems very expensive, and it’s so much easier getting it at home. As we left, a group of Englishmen were discussing the merits of the most expensive bottle – they had written tasting notes on every one of the 35! Since we had a late breakfast, we headed up to Dijon after touring Beaune’s Notre Dame. Pretty big, but then Beaune is Burgandy’s wine capital. 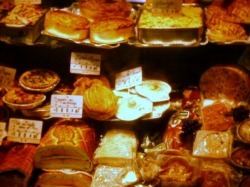 Dijon was disappointing – too much of a big city. Parked – underground – then took a ½ hour stroll and left. Then the day’s big drive of 3 ½ hours to Colmar. Lots of traffic entering the city, but once we parked not so bad. Oh yeah, stopped at a roadside stand for steak and frites on the way – steak a little underdone, but ok. Frites good. Tried a couple of hotels in Colmar, but all full. Eventually found the Ibis, which is a French chain – like a Holiday Inn, but rooms half the size. Designed for efficiency! Once you get over the initial shock it’s not so bad – quite modern. 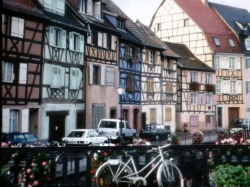 Took a walk around Colmar, with its half-timbered houses – quite extensive, since it was spared bombing in WWII. Will get up early (?) and take photos before the tourists arrive. Tried to call Continental Airlines from Dijon and again from the hotel, but gave up – I must be missing something. Got the number from Information, but sometimes it doesn’t go through, other times wrong number. Gave up and dialed the States to confirm instead. Walked around Colmar and discovered the Restaurant Bertholdi for dinner. Jill had salad, chicken, and sorbet – salad good but chicken pretty weak – what do you want for 98F? I ordered salad, steak au poivre and a délice caramel a la carte and was pleased. Had the $30 bottle of Burgundy we should have had last night – good. Lots of German influence here – food, architecture, and language. Just like the Swiss influence in the Alps.